profile photo frame looks like. Join the School Sisters of Notre Dame (SSND) celebrating sisters during the month of March in conjunction with National Catholic Sisters Week (March 8-14). SSND will be sharing stories from sisters, associates and lay people, who actively fight injustice in the St. Louis community, on social media and with a billboard campaign in collaboration with the Communicators of St. Louis Sisters (CSLS). If you have worked with, or been impacted by SSNDs, you are invited to join the conversation and share your stories by using the hashtag #StandWithSisters on Facebook and Twitter throughout the month of March. You can find and share important messages from St. Louis sister congregations on our Facebook page. You can also use the Facebook profile photo frame that says #StandWithSisters (instructions on how to do this below) to show your support. The full campaign and more details can be found on the CSLS website. The billboard messages will encourage you to check out the hashtag #StandWithSisters and engage with us on social media. Share your story on Facebook or Twitter of how you stand with sisters and include the hashtag #StandWithSisters in your posts. We have created a Facebook profile photo frame for supporters to use throughout the month. 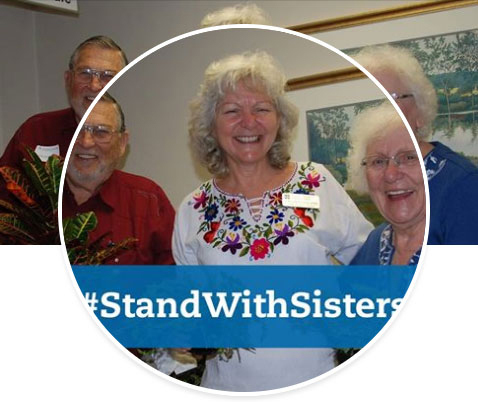 Find the #StandWithSisters frame and add it to your profile picture. Go to your Facebook page and click “update” on your profile picture. Search for “Stand with Sisters” and select the frame from the menu. Like and share #StandWithSisters posts with your friends to help them reach a wider audience. Prayer through quilting Sister Josephine Niemann displayed two fabric pieces at Good Shepherd Gallery in north St. Louis to honor Pope Francis’s encyclical Laudato Sí. The quilt, “Global Warming,” and the banner, “Creation,” represent a creative take on the serious subject of caring for the Earth.